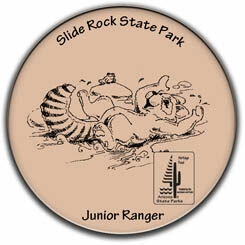 If you're between ages 6–12, you can become a Junior Ranger at Slide Rock State Park! Pledge to do your part to help preserve the beauty of the park for everyone to enjoy! It's A-Maze-ing: Slide Rock is much more than a swimming area; it’s a nature preserve, trout fishing destination, an apple orchard, and more. All the features in the park are protected, so please do not disturb the wildlife or remove rocks or vegetation. 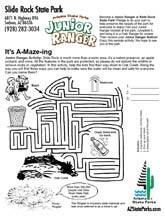 In this activity, help the kids find their way down to Oak Creek. Along the way you will find three ways you can help to make sure the water will be clean and safe for everyone. Can you name them?